I never thought I’d ever utter “OMG, Steph Curry and I have something in common!” – but as of a few days ago, that’s exactly what I’ve been able to say! The big news was “Stephen Curry credits contact lenses for reversing shooting slump” () – I thought, what’s the big deal that Steph Curry now wears contact lenses? As I began searching through the various news outlets, I was surprised to learn that he was diagnosed with a degenerative eye disease called keratoconus. Keratoconus, what is it? The name alone brings to mind some exotic Greek dessert than a debilitating eye condition and it affects 1 in 2000 people and it just so happen, Steph and I are the lucky 2 out of those random 2000 people who happened to have drawn the short straw and have it! Keratoconus is when the cornea, the clear front surface of the eye, gets thin and bulges outward into a cone shape. The change in the shape of the cornea brings light rays out of focus and as a result, your vision is blurry and distorted, making daily tasks like reading or driving difficult. Onset of keratoconus usually begins in the teens or early 20s, but it can affect children as young as 8 years old or people in their 50s and 60s. 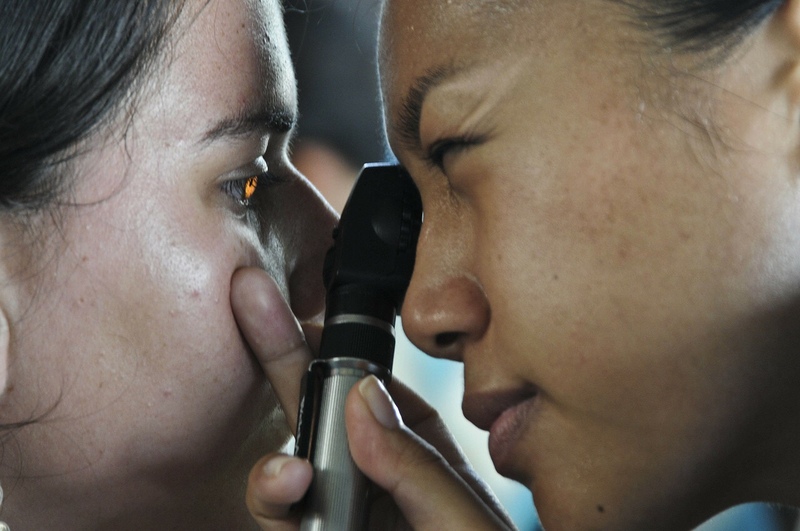 Keratoconus does not typically lead to complete blindness. But the disease can degrade vision to a level where one will experience difficulty leading a normal life. Currently, there is no cure for keratoconus, as it is a lifelong eye disease. I used to say that I always took for granted the ease in which I could take a breath until I saw how my son used to struggle to take that same breath when he was younger. Having almost coming close to losing my vision, I came to realize how much I took the gift of sight for granted until I was faced with not being able to see the world around me, take photos, read a great book and see well enough to drive safely. Being fiercely independent, suddenly losing a big part of my independence because I had to rely on others to do the simplest of things for me or helping me get around was difficult. Also, as someone who often saw the world through the lens of a camera, losing my vision was devastating. It was 2 years ago when I was diagnosed with the degenerative eye condition that few people have heard of. All I know is that within the span of a few months of that diagnosis, I went from having NO vision problems to having extreme vision difficulties and my condition had deteriorated to the point where my optometrist could no order special contact lenses with the necessary grade level and curvature which would allow me to see. Those special contacts were only available as monthlies and the standard order was for a six month supply or 6 pairs. For months, I was going through my six month supply within a matter of weeks. I thought it was odd that I’d lose contacts and I couldn’t explain how they managed to pop out of my eyes! My son said “maybe you’re using the contacts wrong.” I kept going back to the optometrist to get my eyes checked because I felt the prescription I had wasn’t working. My vision was still blurred, contacts would pop out of my eyes for no reason, my eyes were sensitive to light (I thought that was brought on by sleep deprivation and having to be at work at pitch black dark) and at night, I’d see halos. I was told the condition is apparently hereditary but as far as I know, no one in my family has this condition and as such my family found it difficult to be supportive of what I was going through and thought I was faking blindness to “get attention,” I just didn’t know how to properly use contacts or I just needed better glasses. So in other words, me not being able to see was MY fault because I must be doing something wrong. It was frustrating because I had little to no support and as such, fell into a deep depression. In one of my appointments, I learned of a promising new surgery that wouldn’t cure me but it would halt the progression of the disease and allow me to see – Sounds great right? The procedure had a 95% success rate and if successful, my vision would be 20/20 or better. But surgery is surgery and one cannot undo surgery – what if I was the 5% that it didn’t work on? This was a risk I wasn’t willing to take given the limited support I had – Also, the surgery was in clinical trials, was very expensive and NOT covered under insurance because it had not received FDA approval yet. So I did what I’ve always done when faced with an extreme hardship, I pushed on – persistent and NOT taking no as a response even though at every turn, I was hitting brick walls (figuratively and literally) and the situation seemed impossible! AND just when I was about to give up hope, I finally found an ophthalmologist who gave me an option I can live with (allowing me to see) that didn’t require surgery. I’m forever grateful for the awesome doctor I found and those whom I shared this with who were so incredibly supportive specially those of who were my eyes when I couldn’t see, never ever letting me fall or stumble under their watch! It was a scary time – trying to imagine the rest of my life and my future not being able to see! Here I am 6 months later and like Steph said “It’s like the whole world has opened up” because the contacts have seriously been life changing!